Albeit a KR1 was the first proper sporty 250 I rode (back in 1990), I've never actually owned one. But, this fellow appeared at a local autojumble last Saturday, and by Sunday night it seemed I'd agreed to buy it! 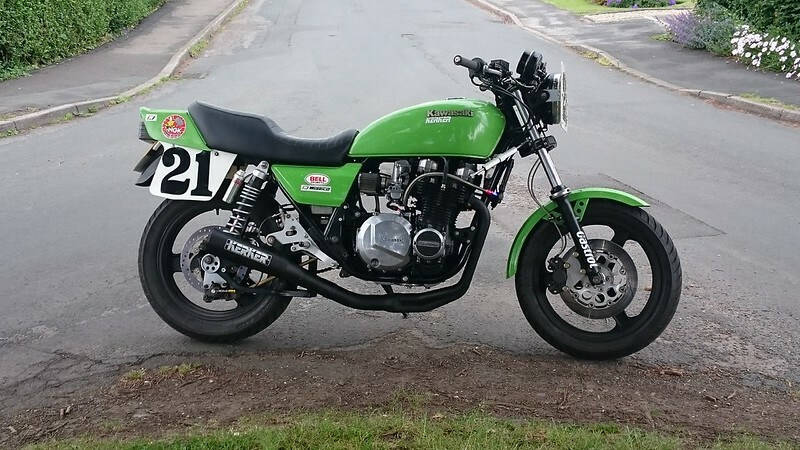 I kind-of have the feeling that somebody knows this bike better than I do, so any info on it (in particular the motor) would be gratefully received. It's definitely a "bitsa", but it has generally been done quite well. There are a few bits to finish off before it either gets an MOT or heads to Cadwell at the end of June (whichever is soonest), but it's generally all there. I know how to search forums, but there may be a few daft questions coming so be prepared! Welcome to the forum. It isn't one I recognise, where abouts are you in the country? I'm about 20 miles from York. I've just noticed that I can add a bit of detail to my profile such as location, so I'll do that. not very much original, but I like it. apart from the seat, that looks like not combining well with the rest. Later RGV swingarm, USD forks, can't identify the wheels, seat is presumably a carbon fibre structure that partially functions as rear subframe, tank supported by special bridge at the rear..... I like it. Yep, not far off. 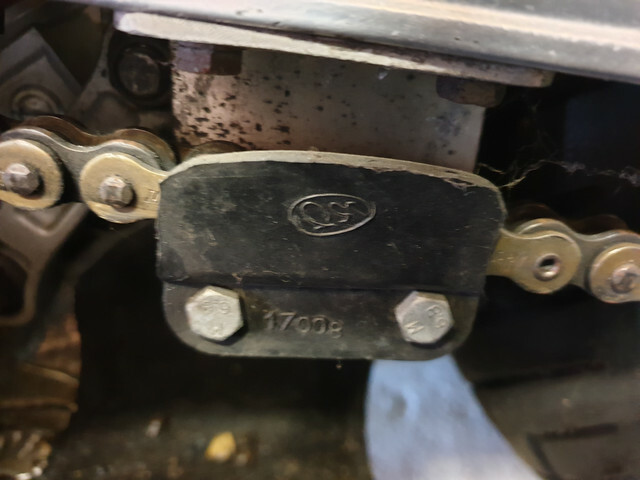 The back end is RGV as suggested with an EMC shock, the front is ZXR400 that has had a trip to Maxton (though need seals and oil, but that's no great shakes) with CBR600 front calipers. 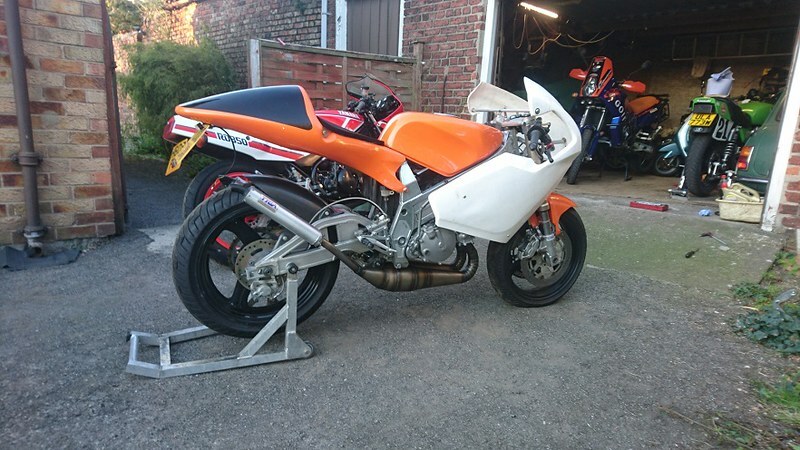 The seat is late h***a RS250 on an ali subframe, with a Replicast "Burning Blood" fairing (what a rubbish name!). I have a screen coming for it. The pipes look to be Lomas with Tyga cans, and the carbs are open into a chopped airbox but it seems to carburate well. I have no idea if anything has been done to the motor but it's very clean and crisp and has the look of a motor that's recently been on the bench. After today's fiddling it now has a non-leaky steering damper that I forgot I had, now mounted in front of the yokes, a set of clocks that work and a chain that just skims the left-hand pipe, which is a little annoying but I'll sort it. Looks like you got yourself a very smart looking KR there, congrats...that a F2 YPVS and ELR in the background as well? Sounds like you'll be local to me and Bernie Coose.. I'm about 10 miles fro York, built mine from a project about 5 years ago and love it (it's road spec but has been around Cadwell a few times). Nice bike you have there, looks like a little sorting and it'll be handy around a track. I'm in Malton and a good friend of mine also has a KR1 and lives just outside of York. It's all his fault! I'm planning on an MOT on the KR at some point (maybe quite soon at this rate), so hopefully it'll be out on the road. yeah I've had chains eating exhausts before can't exactly remember what I did about it though. Might be on my bike still, I'll take a look today. That'd be grand, cheers! I was reading your build thread this morning, but the thread was from 2011 so things may have developed since then.